I recently noticed that HBO-HD (Comcast channel 300 in the Pittsburgh, PA area) was broadcasting in 720p instead of 1080i, which has been the standard for as long as I can remember. Thinking my cable box might have accidentally changed settings, I went into the service menu: the "native" setting was still checked. All research indicates HBO-HD has always broadcast in 1080i. Has something changed on Comcast's end? For what its worth, Cinemax-HD (part of the larger HBO corporate family) is also now broadcasting in 720p instead of 1080i. Appreciate the reply and offer to escalate to a Comcast associate! Evidently, Comcast is migrating ALL 1080i hd channels, which of course is the overwhelming majority of hd channels, to 720p -- that's a statement from a Comcast associate. I guess the process is under way in the Pittsburgh, Pennsylvania market (my location), because TCM (Tuner Classic Movies) is now in 720p. Most commenters are saying that Comcast is doing this to fit 9 720p channels into the same bandwidth that held 8 1080i channels. Wow. I've been waiting years for Comcast to convert all the SD pay sub-channels into HD. Guess that ain't happening. I know it's a frequently debated point -- which is better - 720p 0r 1080i - and for what kind of content? -- but this seems like a step backward. Maybe action movies will pixelate a little less in fast scenes, but most documentaries -- really, anything with little or no action -- will be losing a bit of detail. I wonder if the actual broadcasters are aware of this. I checked a few recent bills: there has been no statement about this change. Not cool. HBO HD is expected to be in 1080i. To access the User Settings Menu, power On your TV and power Off the box. Press the Menu button on either your remote or the box front panel to call up the on-screen menu. You may use either the DVR front panel or remote to navigate the menu. Press the up-down arrow buttons to select the setting you wish to change. Press the right-left arrow buttons to select an option for that setting. To exit the setting and move to another setting, use the up-down arrow buttons. The first user setting, referred to as “TV Type,” tells the box what type of TV you have and how you prefer to watch wide-screen programming. >> 4:3 Pan Scan (wide-screen programming is cropped to fill your screen). >> 4:3 Letterbox (wide-screen programming will appear in its entirety with black bands on the top and bottom of the TV screen). For wide-screen TVs, choose 16:9. The next setting is referred to as Y Pb Pr OUTPUT and indicates the picture resolution output from the DVR box to your TV. The choices are 480i, 480p, 720p, and 1080i. For most standard TVs, the appropriate setting is 480i. Choose 480p for enhanced definition TVs. For HDTVs, choose either 720p or 1080i. Refer to your TV owner’s manual and choose the setting that indicates the highest picture resolution your television will support. This setting provides the ability to specify how 4:3 standard definition programs are displayed on your TV. The choices are OFF, 480i, 480p, or stretch. For most standard TVs, this should be set to OFF (the DVR will default to the resolution selected in the previous setting). For HDTVs, the appropriate setting is either 480i, 480p, or stretch. If you have a wide-screen TV and select the stretch setting, 4:3 programs will automatically be stretched to a wide-screen 16:9 aspect ratio and display video in the format you specified in Step 3. Consult your HDTV owner’s manual to determine the appropriate setting. Press the Power button on your DVR or your remote to exit the menu and save your settings. *If the on-screen menu does not appear on your TV screen, your TV may not support the default setting. Use the DVR front panel LED to view and change your settings. Use the up and down arrows to navigate categories and the left and right arrows to navigate within categories. I have a Motorola RNG200N (DCX3501), one of the non-X1 boxes that support a native setting. I've had the box for 2 or 3 years, and it's always hooked up to my tv via HDMI and set to native resolution for the HDMI/YPbPr setting. When I'm watching HBO-HD, Cinemax-HD, VICE, TCM and a few other channels that should be broadcasting in 1080i (as they always have), both the box (again, set to native) and my TV itself show those channels are displaying in 720p. My plasma tv pauses briefly when resolution changes, so it's easy to notice. A Comcast employee said that Comcast is changing 1080i channels to 720p. That employee was you, ComcastTeds. ; ) Seriously though, I do appreciate the help. Do you have any more information about this change from 1080i to 720p? I'd love to get a clear answer -- and if channels are changing resolution, a list of all those channels. Are the broadcasters themselves aware of what Comcast is doing? If this is true, this is a downgrade from the broadcaster's source. I'm watching Eternal Sunshine of the Spotless Mind on VICE right now, a movie I've seen many times, and the loss of detail in downgrading from 1080i (VICE's standard resolution) to 720p is obvious in certain scenes. And to anyone reading: have you noticed changes like these to channels in your area? And a loss of detail/picture quality? I'm in Pittsburgh, PA, and I noticed this change just this week on channels I mentioned above. Thanks for the additional information. I'm certainly aware of the other thread and the changes when we move from MPEG2 to MPEG4 delivery of certain channels. Not all HD channels are moving from 1080i to 720p. My mistake, I was able to confirm that HBO is one of the channels in your area that recently changed delivery from 1080i to now 720p. 1. Is Comcast downgrading certain channels from 1080i to 720p for X1 boxes as well, or just the non-X1 boxes? 2. Why did Comcast choose to downgrade HBO-HD & CinemaxHD? I ask because they're pay channels and cost extra. 3. You mentioned HBO-HD is changing in my area (Pittsburgh, PA -- South Hills). Is it not changing to 720p across all Comcast cable systems? If not, why did Comcast choose to downgrade it here? 4. Can you provide a list of all channels that are being downgraded? We are moving certain HD channels to 720p60 as we move to MPEG4 delivery. Based on extensive testing and research, we’re confident the combination of MPEG-4 encoding and the progressive format will allow us to deliver superior video performance to our customers. But why would Comcast downgrade HBO-HD and CinemaxHD? They're pay channels & cost extra. Why not downgrade the shopping networks, the religion channels, and anything else on basic cable? Just to confirm: if I switched to an X1 box (from my non-X1 box, which channel 1995 says is still completely compatible with system changes), HBO-HD and all the other channels downgraded to 720p would be downgraded on the X1 box as well? Most all HD channels will be moving to 720p60 (as mentioned above) across all of our video devices and platforms. Below you said "Most all HD channels will be moving to 720p"
Two replies earlier you said "Not all HD channels are moving from 1080i to 720p." The vast majority of hd channels broadcast in 1080i; that's the resolution the broadcasters themselves use. Are you saying Comcast is going to downgrade the majority of hd channels? When was Comcast going to announce this to customers? Obviously Comcast has been alerting us to the system changes through the "upgrade your box" messages, but at no time has Comcast said they'd be changing resolution on channels. Apologies. Thanks for allowing me to clarify. Not all HD channels have yet moved from 1080i to 720p60 delivery. We have made this change to some HD channels already in your area. We expect to move most all HD channels to 720p60 delivery in the future. Some cable and broadcast networks already deliver content in 720p - the multiple channels from ESPN, ABC, Disney and Fox to name a few. We haven't changed the resolution of any local broadcast HD channels. As noted earlier in this thread (and as early as July in other places online): Based on extensive testing and research, we’re confident the combination of MPEG-4 encoding and the progressive format will allow us to deliver superior video performance to our customers. As of this morning (northwest Georgia), all my channels are now 720p as far as I can tell, at least all my favorites. It was only about 6 channels for the past two months, so looks like the transition is going into full effect. Major disappointment, and very noticeable quality reduction on 60" plasma. Will be exploring new TV subscription options, thank you for making my decision to cord cut much easier now. I do appreciate the replies, but I do not have the same confidence in Comcast that you do. And the oft-repeated line -- "some cable and broadcast networks already deliver content in 720p - the multiple channels from ESPN, ABC, Disney and Fox to name a few." -- is sidestepping the obvious. Those networks chose to broadcast in 720p and prepare their signals to be viewed as such. They are a small minority among networks. Most networks chose to broadcast in 1080i and prepare their signals to be viewed as such. Comcast is downgrading their signals and ignoring their intentions. I know you have to repeat the corporate line. I just wish the corporation would stop giving it in the first place. If Comcast is so confident that what they're doing allows you to deliver superior quality video by down-rezzing and bit-starving 1080i channels, let's see the research. I want to see the research that says down-rezzing a 1080i channel, which is displayed at 1080p on almost every display in use today, provides for a better quality image. My guess is that there is no such research, that it's just PR spin to cover the fact that this is being done solely to save on bandwidth to enable higher Internet speeds and to provide bandwidth for the IPTV transition. Telling your subscribers that this is to improve picture quality is just insulting their intelligence. But then again, when has Comcast really cared about what their customers want? The days of quality image TV are gone at Comcast, you want great picture quality, go to DirecTV, which is exactly what I'll be doing. While Comcast is down-converting everything(except locals) to 720p, DirecTV is already providing 4K broadcasts of some live sports. Comcast, the provider of yesteryear. With Comcast moving from 1080 to 720, I will be moving from Comcast to DirecTV. This is the last straw. Yes, Comcast is downgrading all 1080i channels to 720p. It's being promoted as an "upgrade," which is patently ridiculous. The more I watch the down-rezzed channels, the more the picture quality loss is obvious. Example: watching the terrible Fantastic Four movie on live HBO-HD, I noticed how blocky the flames appeared on the Human Torch when seen at a middle distance. HBO-HD On-Demand is still (for how much longer?) in 1080i, and the same movie doesn't have those issues. Dear Comcast employees -- have any of you bothered to compare linear HBO-HD with On-Demand HBO-HD? See what I'm saying? How can you continue to tell customers it's an upgrade when you're plainly showing us it's not? To everybody who's chiming in: would you mind mentioning your location and which channels have gone thru the change? I'm in Pittsburgh, PA, and so far about 10 channels, including HBO-HD and CinemaxHD, have been down-rezzed from 1080i to 720p. Anybody else try to contact HBO to find out if they know what Comcast is doing? I've tried twice and still haven't heard back. I have CableCard feeding to HDHomerun tuner (which then feeds HDHRViewer app), which reports the exact resolution and codec for each channel. CNBC was looking great at 1080, now just looks hohum. I don't need to see Cramer in 1080 BUT if the sports channels that are currently 1080 are downgraded to 720 in this transition, that would be pretty bad. Question to Comcast staff: Is this downgraded resolution for H.264 channels temporary (as in just a few months or less)? If this isn't a short term blip, please leave the sports channels at MPEG2 (until 1080 for H.264 can be deployed). Is sports better at 60fps vs 30? All of the h.264 720p stations are 60fps. The others are still 30 fps. And there are converted h.264 stations that are still 1080i. We all would prefer 1080p @ 60fps h.264 but you know that's not going to happen. On my 2015 Sony (which receives 60 fps from RPi2 client rendering HDHRViewer app), I can't tell any difference in frame rate between various Comcast-carried sports channels, or between those Comcast channels and OTA equivalents. It's all good. I can tell the frame rate difference between that new TV and a 10 y.o. Toshiba (with 1st gen CableCard slot) that is capped at 30 fps, with the latter being "slightly annoying" for really fast action. However even then frame rate, to me, is significantly less important than resolution. In a 3 1/2 football game, real action (between snap and whistle) is often quoted to be something like 8-10 minutes (or insert your own low number). Real "fast" action (that would trigger a frame rate concern) is obviously some subset of that. Similar stats are often mentioned for baseball -- 90%+ of the time players are just standing around (maybe 99%, before new game flow rules this season <g>). 1080 is "pretty sweet" HD, while 720 is "a tad fuzzy" HD, with the difference being noticable 100% of the time for a given game. But is that true when the lower resolution is progressive at twice the frame rate versus the higher resolution that's interlaced at half the frame rate? With Comcast downgrading all channels to 720p, I don't know how they have the gall to claim that their service is the Mercedes or Tesla of content delivery services. i just got a letter saying my area is being converted to MPEG4 on November 15th and I'm not looking forward to it. This is really just a way for Comcast to make more money. Downgrade channel quality so streaming services look better and then cap Internet usage and charge overages. re: above in red, that is not true. there is no difference in picture detail at all between i/p (interlace/progressive) streams. that is an engineering statement. the i stream is larger due to overhead of the stream. The reason they can't degrade broadcast (local) channels is FCC regulations that require the written permission of both the broadcaster and many of the producers of the content. The exception to this is in streaming to mobile devices/computers which is why we have to accept the terms and conditions before using it. Watching Sunday Night NFL on (Comcast) NBC right now, 1080 MPEG2. Pretty sweet HD (notwithstanding the fact that I'm watching via CableCard instead of my awesome attic antenna). Watched Dodgers and Cubs on FS1 earlier, 720 H.264. Basically, it's a fuzzy, so-so HD experience. Surfed to neighboring CBS Sports, also 720 H.264, also fairly fuzzy picture. So on *my* Sony 4k, "No" I'm not getting the benefit your are noting, as 720 H.264 is no match for 1080 MPEG2 on my TV. Not even close. My Sony TV does both 4k upscaling and refresh upscaling (to 120 Hz), so other's milage may vary (e.g., depending on interpolation etc.). On mine, the "new" 720 H.264 is rendered such that it is visually noticably inferior to existing 1080 MPEG2. What's funny to me is that this MP4 roll out (largely) bricked the (1st gen) CableCard slot on my 2006 Toshiba which was a 1080p TV. It's a decade since I bought that TV and I hope Comcast is not doubling down on 720. "The 2000s are calling, and they want their 720 back." Seriously, elsewhere (e,g., TV manufacturing and streaming spaces), seems people are ramping up for 4k. No one is ramping down to 720. Unless Comcast is about to pull an AT&T here and announce it's deprecating its current system and going all in on IPTV, this make no sense to me. If they hit the 1080 OTA channels with 720 as well, I'll be watching via antenna -- difference is just too big. Wishful thinking. Hopefully XFINITY realizes 720p won't cut for all channels given enough feedback. I have X1 but came across this post while searching into the picture quality issues I have been noticing. This 720p "upgrade" as comcast calls it is not good. Here is what I am seeing. This is what it looks like to be honest. I keep using HBO as the example but the others they "upgraded" are the same. I can't believe this isn't getting more attention. Just shows that they know the majority of consumers simply dont care. Here is a detailed post at broadband reports about it. I find it absolutely fascinating, and disturbing, that Comcast is going from 1080i/30 to 720p/60 resolution for a majority of their HD channels (including premiums) during the conversion from MP2 to MP4 encoding. I currently have a Motorola DCX3400M DVR connected to a Samsung 43" Plasma (768p native resolution), and two Motorola DCX3200M boxes connected to Toshiba 32" 1080p LED-LDC. For the 43" Plasma, I have the DVR box set as Native Output. That way it is Samsung Plasma that does all the converting to its own internal native 768p resolution, as numerous tests have found that looks best. If I were to select 720p fixed Output on the DVR box, then SD 480i and HD 1080i looks soft and fuzzy. If I select 1080i fixed Output, than SD 480i and HD 720p looks overly sharp and pixelated. WHY? Because the BOX is converting everything to 1 resolution. That is why Native works best with the Plasma. (Though for the two Toshiba 32" 1080p LCDs, I have the best image with the cable boxes on those set to 1080i fixed output, as the resolution converter on the Toshibas aren't that good). So basically Comcast will sort of be doing the same thing on their end going forward with the MP4 conversion, as they will convert native 1080i/30 broadcasts to the 720p/60 format. I would like to know what type of hardware will be doing this conversion. Each time there is a change in resolution from the optional, the picture quality will suffer, especially from going from 1080i to 720p, or from HD to SD. I have done a lot fo video editing from home (Using Sony Vega Pro), and have seen this on many occasions. What Comcast should of done, was to leave the resolution alone when going from MP2 to MP4 encoding, as MP4 is already more efficient in bandwidth compression than MP2. OR really be nice and do an upgrade from 1080i to 1080p on their end. As of now, I'm my area of South FL/Pompano, MP4 has not rolled out yet, as channel 1995 just showed up a month ago, and HBO is still 1080i. I wonder how long it will take until it hits here. I was optionally glad to hear about the change to MP4, but now with channels going to 720P, this is really a step back in picture quality. Funny how Comcast is going to MP4 encoding, offering faster internet speeds, as well as getting ready forDOCSIS 3.1 next year, and even Fiber to Home in some markets, but with all of this is lowing picture resolution of HD channels from 1080 to 720. As of 11/2/16, in Pittsburgh, PA (South HIlls area), Comcast had downgraded (down-rezzed) all the 1080i channels to 720p. The only exceptions are local channels and broadcast networks: ironically, that includes Comcast-owned NBC. The loss of picture quality is obvious. Comcast's explanation of this downgrade as an improvement is ridiculous. I'm watching Fargo on the OvationHD channel right now: it's grainy, murky, and terrible. The scenes in snow-covered fields look so bad I wouldn't even consider this DVD quality. I've watched Fargo over the years on any number of 1080i hd channels on the Comcast system. It has never looked this bad. Will Comcast also be downgrading 1080i to 720p on all the On-Demand content? it really isn't downgrading. If you do a google search and read the technical information articles discussing the debate of 720p vs 1080i (progressive versus interlaced) points out that 720p60 is actually better than 1080i in true reproduction. Additionally the progressive encoding is in the format necessary for streaming to IP and other portable devices. I do an unintentional comparisson a few times a week. My mother in law, who watches our children, comcast hasnt changed and mine has. The difference I see each time I go to her house is completely obvious. I can't believe more people don't care. I'm familiar with the debate and technical details of 1080i vs. 720p. Both have their virtues. I'm upset that Comcast has taken the 1080i signals that the vast majority of channels choose to use and downconverted them to 720p: there is a loss of data in this process.This downcoversion doesn't apply to the handful of channels (ABC, ESPN, NatGeo, etc.) that choose to use 720p. Those channels still look fine. The 1080i channels now look worse. They've lost detail. Comcast has never done a great job with picture quality. If they really cared about pq and progressive encoding, why didn't they choose 1080p and finally do a great job at delivering good ol' HD? I gotta ask: has the change happened on your cable system yet? If so, how does it look? I haven't found a single comment on these forums that says the picture quality has improved under the new format. Both X1 and non-X1 users are experiencing a loss of picture quality. The OP provides a detailed technical analysis of the downconversion. Glad I found this discussion. I've been thinking about switching to Comcast primarily for cost vs DirecTV. Plus D* has done a terrible job, so far, enabling what 4K content there is. Thought Comcast might do better [and still may]. Trouble is - for the 2-4 years it takes cowardly networks and distributors to get it rolling in the US we still need to rely on HD. I don't find a quality lower than 1080i acceptable. Guess I'll experiment with DirecTV Now when the free trial is available - or wait for Apple to come up with a decent package. Their 1080p [mostly] AppleTV works fine for me. OMG I thought I was imagining that HBO-HD on Comcast in Atlanta used to be 1080i. So glad I found this discussion. October 2 was 1080i. Every episode since then has been 720p. THERE IS SIMPLY NO COMPARISON. The 720p episodes look like mud compared to the 1080i episode. How in 2016 (almost 2017) are we going backward while Comcast prices go up up up??? This is absolutely unacceptable for a Premium HD channel that we are paying good money for. Yep, the PQ of HBO from the DirecTV Now streaming service is better quality than Comcast now. I just want the old 1080i (good) picture back for DVR and Live TV. If you watch Game of Thrones just wait, all those dark scenes are a mess. Same with The Walking Dead on AMC. information only, if you don't appreciate tech talk, please skip this post. The FCC has zip to do with which format cable sends you the signals. The broadcast networks and cable networks have moved away from 'interlace' as the need is gone to produce/output for 'interlace' driven TV equipment. Interlace isn't even used by sports networks due to the pixelation of fast movement which is an artifact of ripping a picture into diagonal strips of information (much like a strip shredder) and then then reassembling them where the image has changed from the first 1/2 of the ripped picture (called interlacing). The interlacer then has to compute major changes in movement and creates an approximation of what moved and where it would be in the next 1/60th of a second. At best it is 1/2 of a picture resolution of 1080 (actually 1088 with 8 blank lines) sent 60 frames a second, each of which has to be reassembled into a picture again at the receiving end and 'deinterlaced' (another math intensive estimating process). Progressive 720p60 (if your TV can use at rate of 60 else 30)) means you get 60 full images (or the changes in the image with mpeg4 encoding) every second. No math required, no computing of interline picture information. The flat panel TV circuits take signals and outputs to its own display panel in the maker's own progressive format, an easy process since image is already in whole picture full frame information format. The Progressive recording is needed by streaming devices. Having assets in 720p60 files in servers allows delivery to any device with just one file. The industry movement is to have fast encoders able to produce whatever the bandwidth and device display size needs from that original file that is encoded and delivered 'just in time' to the user. Yes, BetaMax was a better picture than VHS but you could not move the machine without it going out of alignment. VHS won with an inferior picture. With interlace losing out (old tech dies) to progressive, at least it is the better picture information (detail) that won. I hope you get something from comcast for your posts... I really do. It's the only explanation I have for your responses at this point. While I and others fully understand your comments, the fact remains, Comcast is the only one doing this. Plus, ESPN 720p looks fine on Comcast - Comcast's 1080i to 720p channels look awful. No math needed, we can all see it with our own eyes. I can agree with everything you say about 720p but Comcast's bandwidth starved 1080i to 720p conversion simply looks like DVD quality. I'm not sure why you believe any channel is bandwidth starved. mpeg4 encoding is state of the art. If you mean DVD channel streams embedded in a QAM channel with other channels, usually SD cause bit-starving (is that a real term?) it just doesn't. multiplexing multiple live data streams in same frequency band has been around for decades (FM radios for example). Lasers are doing it by mixing different wavelengths (basically colors) on the same fiber transmission line. This doesn't interfere between the wavelengths. The FCC has zip to do with which format cable sends you the signals. True, but they have everything to do with consumer rip-offs. Slashing resolution of premium pay channels- including HBO and Showtime- with no reduction in cost qualifies as a consumer rip-off. And no tech-talk is needed here either. I have DVR'd programming from dozens of channels when they were 1080i here in Atlanta before mid-October. Compare any of them with the current 720p programming- it's a muddy pixelated mess. All this on my Samsung 55KS9500 4K UHD TV which can handle anything you throw at it. Simply look at my DVR'd content before and after the change- simply no comparison. My FCC complaint is filed. It has nothing to do with tech specs and everything to do with consumer rip-off. You continue to repeat ad naseum a misleading explanation of the differences between 1080i and 720p as a way to justify Comcast's downgrade of cable signals. And you're are completely wrong when you say broadcasters and cable channels are moving toward progressive formats with linear channels. They aren't downgrading their chosen 1080i signals to 720p -- Comcast is. No matter how many people across the country, over many months if not years, complain about a loss of picture quality, you pretend the 720 progressive format is an improvement. Clearly, for those watching on TVs, it is not an improvement. I think you're abusing your position as a non-employee moderator and essentially trolling frustrated customers, who come to these forums not realizing they're quite likely another dead-end in their pursuit of answers from Comcast. In these particular discussions about picture quality, you are not helping. That, sir, is technobabble hogwash. One of the basic problems is inherent with a 720p res transport stream having to be upscaled to fill a 1080p TV screen. Either the TV has to upscale it or the set-top box must upscale it. Otherwise, you'd have a 1280x720 with black bars all around it sitting in the middle of a 1920x1080 native resolution screen, and PLEASE do NOT try the "they're all 1366x768 native" on me. ALL my TV's and computer monitors are true 1920x1080 16:9 or 1920x1200 16:10. The ancient 1366x768 TVs are mostly sitting in the rubbish heaps of unwanted electronics now. The current marketplace is selling 1080p and is pushing 4k UHD with 4x the pixels (and Comcast is stepping backward?). The second basic problem is compression and the REAL information content being delivered by the video bit rate. The artifacts in the high level of compression now being used are accentuated and exacerbated in the process. If a lossless 720p/60 stream was being delivered that would be one thing, but it's about 3.5 Mbps with both 5.1 ac3 audio and H.264 video streams combined. Take out the 384 kbps AC3 and you've got about 3.2 Mbps video. Compare that to a Blu-ray 1080p/24 at 9-10x that with AVC, another form of MP4, with 30-35 Mbps (and yeah, my Blu-ray player can tell me what the audio and video bit rates are realtime). It's easy to see the PQ degradation, and I can see it comparing the local broadcast stations still being streamed in 1080i MPEG2 with the highly compressed 720p MPEG4, which is mushy looking by comparison, lacking the sharpness of detail contained in the 1080i, and if you pause on individual frames it's very visible. I recorded AMC-HD's "The Day the Earth Stood Still" (2008 remake) on December 4th, after the channel had rolled over from 1080i MPEG2 to 720p/59.94 MPEG4. I recorded CBS's MacGyver last night on a channel still running 1080i/29.97 MPEG2. The difference between the level of fine detail, especially in textures, and real edge sharpness is inescapably palpable. Try arguing now that somehow Comcast's 720p MPEG4 transport streams contain more "real" information than the 1080i MPEG2 transport streams. Hogwash. They contain not only less, it's substantially less. The 720p MPEG4 file with a run length of 2-3/4 that of the 1080i MPEG2 is substantially smaller. It's not about what's theoretically possible with lossless video streams, it's what's actually being delivered and the level of compression being used. Not only was the resolution downgraded, lossy compression increased, and the 1080i also shows some of its compression. It's all about bandwidth. In order to shoehorn more channels into the same bandwidth requires sacrificing REAL information content (i.e. the video bit rates) per channel. The result is 720p MPEG4 mush. It's not High Definition, it's Horrid Definition. You say they are not starved. Then why is the below happening? The first image is front an episode before the conversion was done, the second from an episode after the conversion was done. 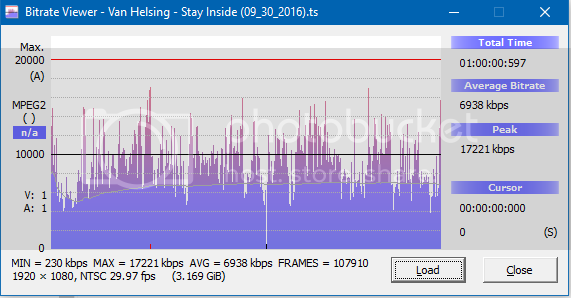 @There are several shows on Syfy where the resulting bitrate and file size are identical(1.65GB @ 3.94Mbp/s per kmttg) for over 20 episodes since the conversion which tells me that there's a hard bandwidth allocation setting in the stat-muxing and that the amount simply isn't enough, and these shows are banging up against it resulting in very poor quality images. If I was recording more shows on Syfy I have no doubt they would all have the same bandwidth and bitrate. Note what looks like a "hard ceiling" on the post-conversion MPEG4 version and how the pre-conversion MPEG2 version has a much more dynamic flow of data peaks and valleys; the content is getting some "room" to express itself. The post-conversion file is pretty much locked into pounding a ceiling at around 3200kbps; it's "screaming out" for more bandwidth. Additionally, note how every single episode of Van Helsing post-MPEG4 conversion is exactly the same file size and bitrate while the episode recorded prior to the conversion is not. If these episodes were not being bit-starved then they would not all have the same bandwidth and data totals being used. We understand that you're trying to help out on the forum but please stop parroting the nonsense that Comcast has been stating elsewhere in this forum, it's disingenuous and insulting to the intelligence of those that know better. I can't devote enough time to you to correct your understanding of technology. Let it suffice to say interlace as a technology is ending due to the need ending (no more CRTs). Flat panel TVs use proprietary progressive format to run the panels that you watch on modern TVs. Either the cable box or the TV has to deinterlace the interlaced scan to convert to approximate progressive images. A familiar example is to make 2 8x10 inch photos from a movie film with motion. shred them both and reassemble into one 8x10 with the odd strips only from one photo and the even only strips from the other photo. Where the motion is evident the images will not match/lineup. I posted a video long ago from youtube that is pretty good at explaining the difference. Sure, one day we may get 1080p or better 4k or 8k progressive format but today we are dealt the cards we have. Comcast is smart to convert to progressive format to allow more storage (not a copy of 'progressive' format and a copy of interlaced format) efficiency. The streaming entertainment by your equipment (phones/tablets/desk/laptops) all need progressive image streams.